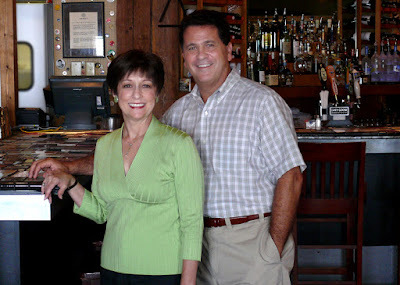 I recently had the great honor of meeting Bruce and Sally Alterman, two remarkable and delightful people who are the owners of The Brickery Grill & Bar. The connection was graciously conducted by Sandy Springs Hospitality and Tourism, one that I would not have made in time otherwise. I'm grateful I had the opportunity to experience this amazing dining destination! This was my first visit to The Brickery and unfortunately my last visit. I had an exceptional experience, however, to the dismay of countless loyal customers, the restaurant is closing on Wednesday, December 23, 2015. In my conversations with Bruce and Sally, and witnessing many touching longtime customer interactions, it became distinctly obvious that The Brickery has been more than a local restaurant. 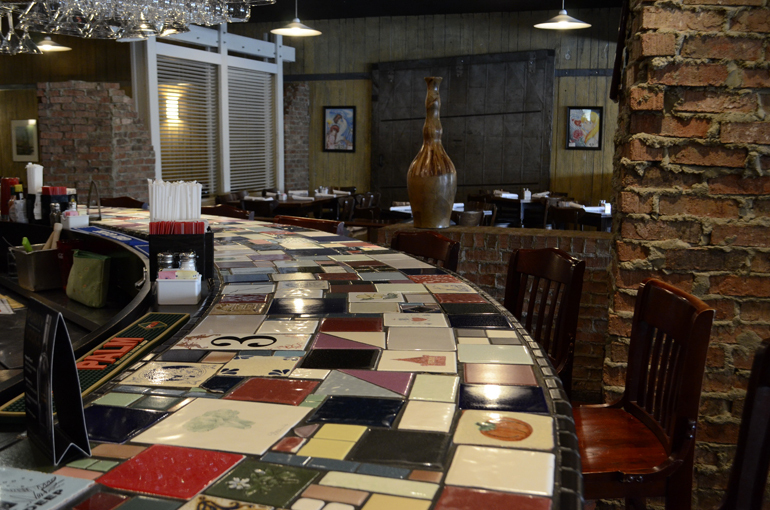 It has been a restaurant "home"; it has been the place where many citizens of Sandy Springs "grew up". While Bruce and Sally are open to the possibility of reopening somewhere else nearby, should this indeed be the final week of The Brickery, there's still one last hurrah on the calendar...the 2016 South Beach Wine & Food Festival in Florida! They won Hellman's "Best Burger in Atlanta" competition, beating out 12 other local finalists, and will be competing with celebrity chefs from all over the United States! Yes, they informed the organization that they are closing, but they're still invited to compete! 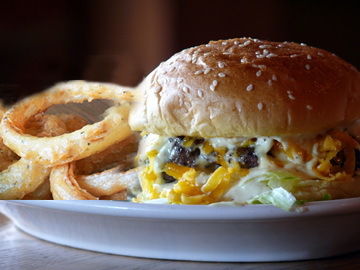 One of their signature dishes, the customer favorite House Caesar Burger, will compete in the 10th annual "Burger Bash" to be held on Friday, February 26, 2016. As of this writing, VIP tickets have sold out, BUT there are tickets still available for the main Burger Bash event, which I'm sure will also sell out. The year's Burger Bash will be hosted by celebrity chef and television sensation Rachel Ray! The panel of judges is equally awesome with David Burtka, Neil Patrick Harris and Natalie Morales! The Food Network & Cooking Channel South Beach Wine & Food Festival event, presented by FOOD & WINE, is insanely popular! "Bring home that trophy, Sally and Bruce!" Sally and Bruce expressed only the sincerest appreciation and gratitude toward their customers and staff. They've created a unique restaurant "culture". I've rarely seen a community like what The Brickery has created, and I love it when I do see it. I invite you to check out their Facebook page for some of the wonderful customer comments...these restaurateurs are definitely going to be missed! Bruce and Sally opened their first restaurant four years before The Brickery. Bruce's brother was operating Perimeter Cafe at Perimeter Mall—I'm certain I dined there, given I worked at Perimeter Mall part-time when I first lived in Atlanta in the late 80s. They succeeded as restaurateurs, with Perimeter Cafe II, in a space where there had previously been four restaurants in only five years! That's also where they started catering. Not wanting a second restaurant—they didn't want to be apart...so sweet!—catering became an additional revenue stream, one that they've continued during their 24 years at The Brickery. When I asked Sally what advice she would give someone wanting to get into the restaurant business, she offered, "Know how to run a business and love people." She explained that it wasn't just about the recipes. You can have stellar food and run a business into the ground...you can have amazing recipes, but if you're not a people person, it's not going to thrive. After 24 years at The Brickery, Sally and Bruce obviously are business savvy and love their customers as much as their customers love them. Knowing it would be a challenge to name a single favorite memory during The Brickery's 24 years, I asked Sally for just one of her favorite moments. She immediately cited the day that they got to cater the 100th birthday of Garnett Cobb, the "Queen of the Sandy Springs". The event was held at Heritage Sandy Springs, a non-profit and park that is part of Garnett's legacy. Garnett had visited The Brickery for her birthday every year for years. She passed away at 104 years of age in 2013, certainly missed by many Sandy Springs citizens and friends. While Sally noted that knowing how to run a business and possessing a love for people are key to success, I think their incredible food is the icing on the cake...The Brickery has amazing food! I believe one of the keys to their culinary success is that they're a "scratch house". As Bruce puts it, regarding the competition, "We cut. They pour." Meaning that The Brickery cooks from fresh, scratch ingredients instead of using mass quantity factory-manufactured products. As a foodie, I can tell you that that makes a huge difference in food quality...The Brickery "gets it". Check out the plump, vibrant red, vine ripened tomatoes pictured on their Facebook timline and you'll see with your own eyes just how fresh and delicious the food is. They source tomatoes, corn and other items from a farm in Lumpkin County, where they also have a cabin. I've enjoyed a number of visits to Lumpkin County, specifically Dahlonega, which is quite lovely. I haven't shared with you the specifics of the Caesar Burger! Hands down, it's one of the best burgers I've had. I say "hands down" deliberately...I made the mistake of trying to pick up the burger with my hands, even after having been sufficiently warned. This is a messy burger! In all the best ways. I do not recall the specific order of the burger's layers, but it includes: buns that are offered in whole wheat or sesame egg (I enjoyed the latter); two different layers of shredded lettuce; their house-made creamy Caesar dressing (delish! ); grated mild cheddar cheese; and an 8 oz. beef patty...and lots of magnificent flavor! Just remember to roll up your sleeves! 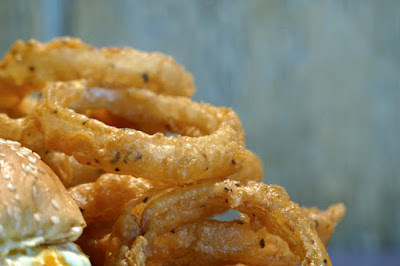 In addition to my amazing Caesar Burger, I enjoyed a side of onion rings...the best I've had in years! I demolished the burger and every single onion ring on my plate! Another best-seller is the restaurant's fried chicken. Bruce treated me to a sample...it's outstanding! I totally get why it's so popular...it tastes perfectly homemade! A fellow foodie friend of mine has been to The Brickery many, many times and raved about the Caesar Burger and said also that their seafood is fantastic. And she highly recommended their martinis, which of course I had to sample—also very well done! She's such a fan that the next morning when I was talking about my experience, she decided to go to The Brickery that evening. Good reports all around! The restaurant's tagline, "Casual Dining...Serious Food", is exactly what diners experience. Speaking of casual, Bruce pointed out to me that some of the staff were in t-shirts and jeans, a perk (to be able to wear jeans on these final days) he and Sally extended the staff if they'd wear a "Caesar Burger" t-shirt, which many accepted. I'm impressed that they've done so much to make closing as painless as possible for their employees. When I arrived, the restaurant was packed! I was graciously offered a table, but was dining on my own that night so I opted for a seat at the bar (pictured above), which had a great view of the whole of the restaurant...win-win! Please allow me to share with you a bit about the staff at The Brickery. Since the announcement in November that the restaurant will be closing on December 23, there have been ZERO employees to leave. That, my friends, is loyalty...they truly must love their Brickery family! How have they managed to keep employees who know their last day will be two days before Christmas? Many of them have worked there for many, many years. The two ladies who waited on me have been there for 9 and 19 years! You really do get a sense of family when you're there. Also, Bruce and Sally started a reverse customer appreciation campaign. I've never heard of something like this, but then I saw it in action. They're accepting donations from longtime customers to go into a bonus fund that will be distributed to all the staff when they close. The fund already has thousands of dollars! While I was talking with Bruce, a former employee—one who started with them when the restaurant opened in 1992—who had dined there that night came up to Bruce and handed him a check for $200 to put into the fund. Another customer later gave him $400 cash for the campaign...and those are just the ones I personally witnessed! What a wonderful demonstration that customers are so appreciative of the service they received over the years...it was quite touching. Yet another endearing moment, The Brickery's former Kitchen Manager's wife and mother stopped by for a visit. After working with Bruce and Sally for 22 years, he lost a battle with cancer. His mother was in town and wanted to see where he had worked all those years. The mother was elated to see so much happiness in the restaurant...such a touching moment. It saddens me that such a treasure in Sandy Springs is closing, but it was quite remarkable to see the outpouring of love for the restaurant, for its staff and for Sally and Bruce. I'd like to offer a huge wanderlust ATLANTA "Thank you!" to Sandy Springs Hospitality and Tourism for connecting me with Bruce and Sally, and a huge "Thank you!" to Bruce and Sally for the dining experience and delicious food, and to The Brickery staff for being so awesome! If you're interested in obtaining a piece of Sandy Springs history in the form of furniture or kitchen items from The Brickery, they're holding an auction on Tuesday, January 5. Stop by and do tell all of your restaurateur and foodie friends! What's next for The Brickery? After the Burger Bash competition at the 2016 South Beach Wine & Food Festival things are up in the air. We may be in the final few days of one of Sandy Spring's most beloved dining destinations.